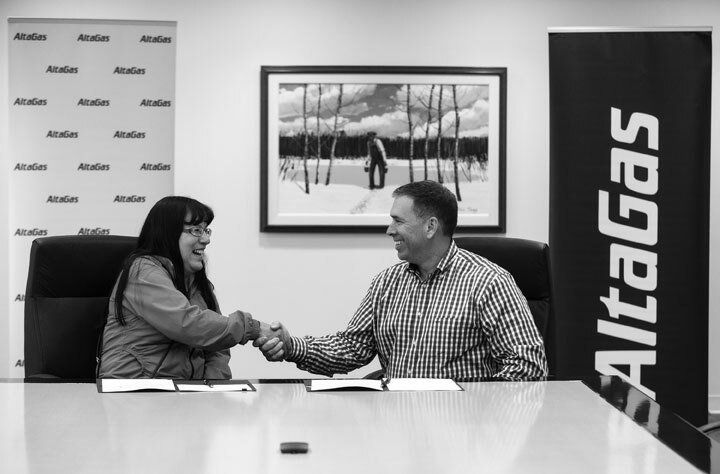 Today, AltaGas Ltd. (“AltaGas”) and Halfway River First Nation (HRFN) signed a Comprehensive Relationship Agreement. The ten-year agreement provides the framework for consultation, financial benefits, community investment, employment opportunities, and support for a wildlife study in HRFN’s traditional territory. AltaGas is constructing its Townsend Facility approximately 100 kilometres north of Fort St. John in Northeast British Columbia on HRFN territory. When completed, the Facility will include a 198 million cubic feet per day (MMscf/d) shallow-cut natural gas processing facility, a gathering pipeline, sales pipeline, two liquids egress pipelines, and a truck terminal on the Alaska Highway. The Townsend Facility is a key component of AltaGas’ Northeast British Columbia energy strategy. The Project has provided members of HRFN with employment opportunities during construction and will continue do so once operational.